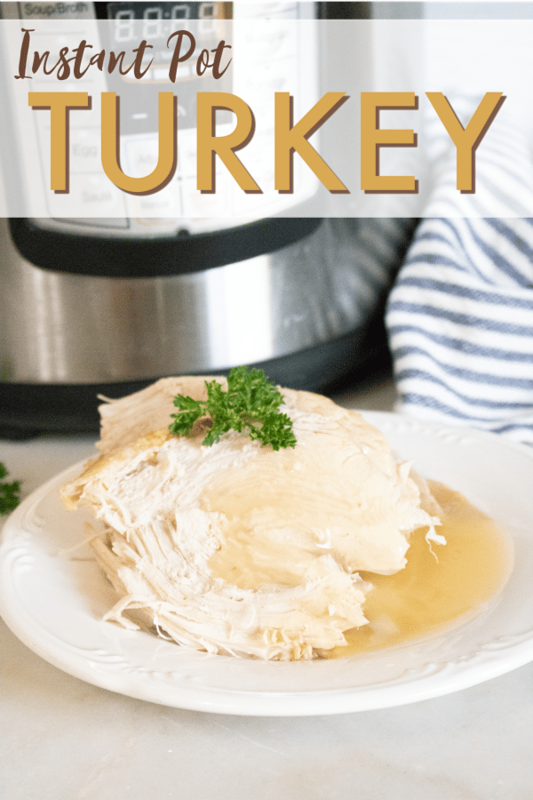 This Instant Pot Turkey is the perfect way to free up your oven for side dishes this Thanksgiving. Better yet, you don’t have to babysit the turkey all day to keep basting it. 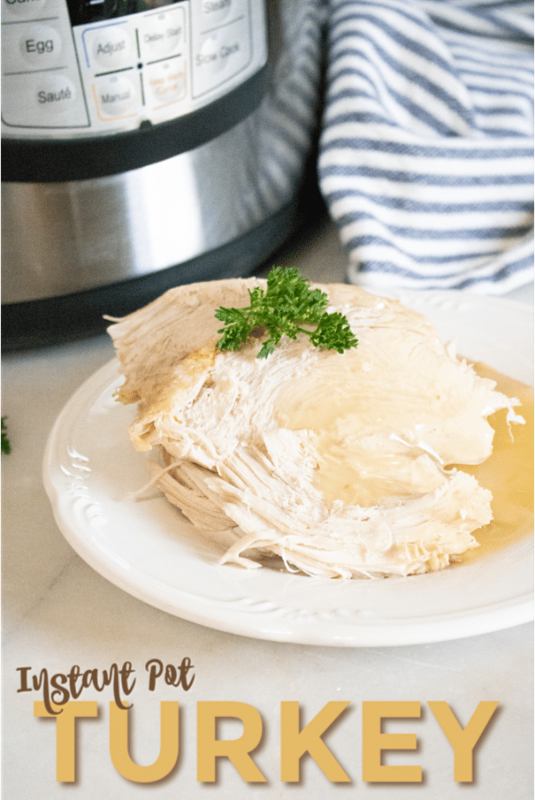 Your Instant Pot will do the job of keeping it moist and delicious! Thanksgiving is my husband’s favorite holiday since it’s all about spending time with the people you care about. With that in mind, I try really hard to make our Thanksgiving celebration about togetherness, rather than slaving over the feast. Of course, a grand feast is still a priority. I just plan all the Thanksgiving details ahead of time so that I don’t have 6 things that need to be in the oven at the same time. That’s why I decided to hand off the biggest oven hog (can I say that when I’m referring to a turkey?) to my Instant Pot. This year, make an Instant Pot Turkey and save the oven for casseroles and pies. As I already mentioned, my goal was to keep this simple. You’ll have enough groceries to buy for your Thanksgiving feast, so we’ll stick with just the basics here. I break my recipes down into steps out of habit but don’t be fooled. Really this is a dump and press start recipe! 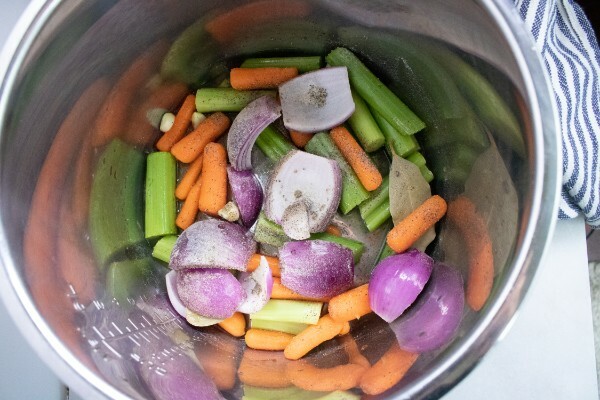 Add 3/4 cup water, celery, carrots, onion, and garlic cloves to the inner liner. 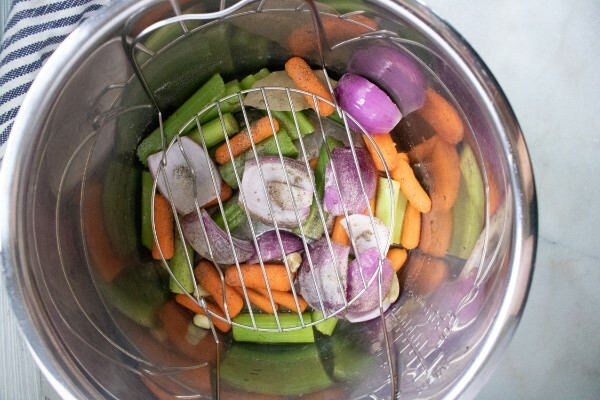 Place the metal trivet on top of the vegetables. Now it’s time for the star of the show. 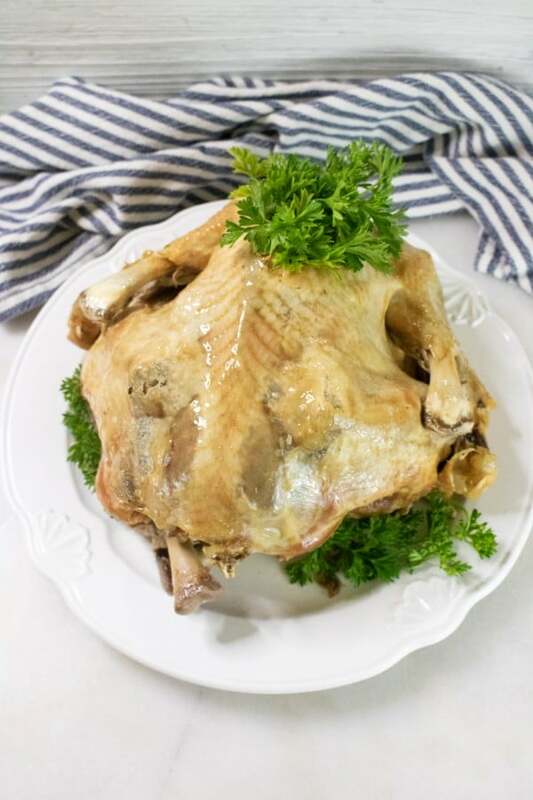 If you want, add fresh sprigs of rosemary, sage and thyme inside the cavity of the turkey. This adds a nice flavor but it tastes great without the herbs too. Carefully lay the turkey on top of the trivet. You can use the trivet handles to hold the wings down. Secure the lid and make sure the valve is set to sealing. We’re going to cook it at high pressure for 6 minutes per pound. I used an 8-pound turkey so I set the time for 48 minutes. 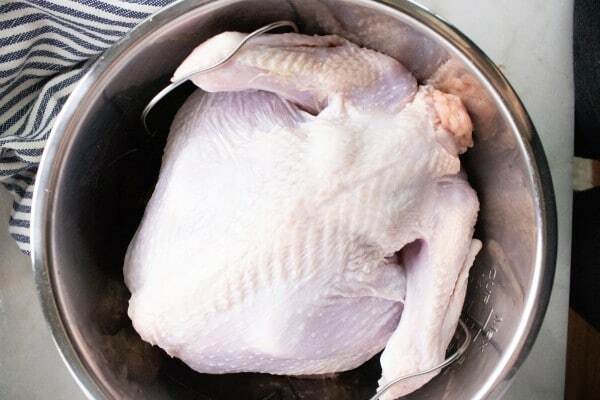 To get a nice, crispy brown skin, move the turkey to a broiler pan and broil for just a few minutes. Slice the turkey just like you normally would and serve with gravy and your favorite sides. 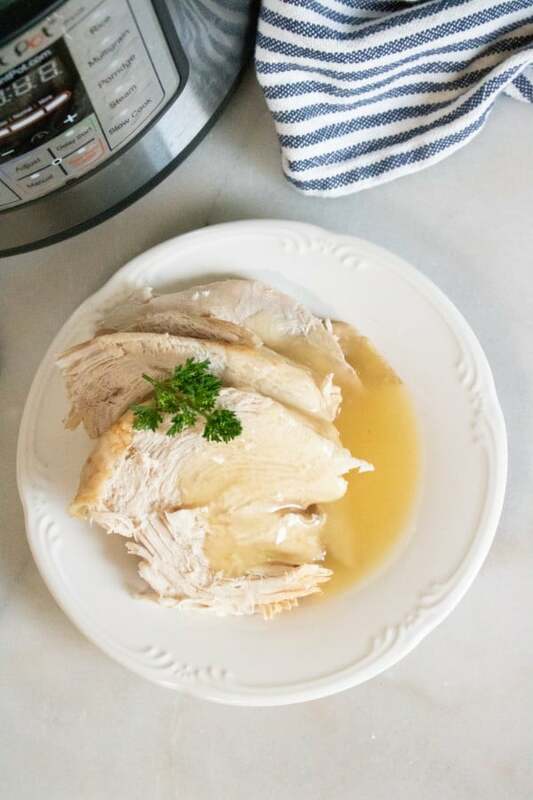 While you have all those yummy turkey drippings in your Instant Pot, go ahead and make Instant Pot Gravy too. Ready to make your own Instant Pot Turkey? Here’s the recipe card with exact measurements. Remove the neck and giblets from the turkey. Set aside for gravy or dispose. 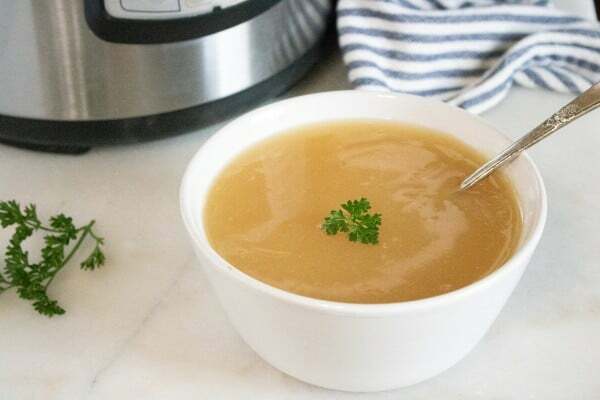 Add water, celery, carrots, onion and garlic cloves to Instant Pot inner pot. Place the metal rack on top of the vegetables. 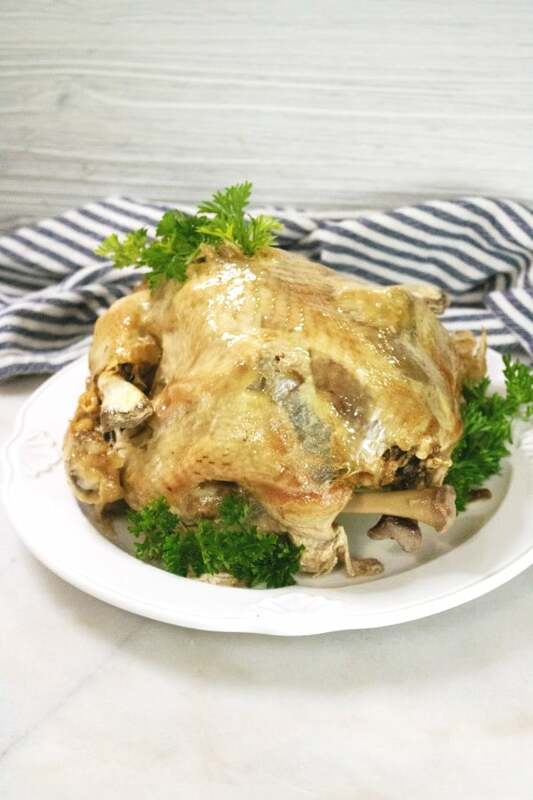 Place sprigs of rosemary, sage and thyme into the cavity of the turkey. Place the turkey on top of the rack and use handles to hold wings. Secure the Instant Pot lid and turn valve to sealingl. Cook on manual high pressure for 6 minutes PER POUND, so for an 8-pound turkey, that would be 48 minutes. After the timer beeps indicating that the cook time is complete, allow the pressure to release naturally for 10 minutes, then let out the remaining pressure by turning the valve to venting. So exciting to make a turkey. However, I have not been able to find an 8 lb turkey at my stores. I have the 6qt and have been only able to fit a 4 lb chicken. So you were able to fit an 8 lb turkey with no problems?? Thanks for the recipe!! I used an 8 quart for this recipe. Thanks for asking since I should have noted that in the recipe (doing that now). You can adjust the size of the turkey to one that fits in your 6 quart and then just adjust the cooking time down accordingly.